« Dear Recallers: Where Are You? Even though my writing can be construed as divisive and I am known to be a bit of stubborn mule when it comes to having to be right, I do often look for the issues that should unite us all as Wisconsinites. Unknowingly, I helped the creation of such an issue when I helped co-organize the Celebrate Walker event in Wauwatosa. As one the original creators of this event I have firsthand knowledge of every facet of it including all the interaction with Wauwatosa Police. Now a month after the event, Wauwatosa officials are starting to debate whether or not they are going to allow free political speech in their city. According to Wauwatosa Police Chief Barry Weber, he would have never allowed for our rally to take place because of the cost to the Tosa taxpayers. While this sounds very noble and righteous, the fact remains that by stating he would not allow our event, he is basically admitting he would trample all over the Constitutional rights of the citizens of Wisconsin. He is asking the powers that be in Wauwatosa to give him the power to say no to people exercising their First Amendment rights. Sorry Police Chief Weber your role should not allow you to limit free speech. In fact you should be on the front lines of protecting our right to peacefully assemble. Police Chief Weber said he was not personally contacted to approve the event. We used the appropriate chain of command that the Chief had in place and it was explained that we would have similar police detail that the recall Walker people had when they invaded Wauwatosa neighborhoods to kick off the recall. Since we were afforded the same benefit the recall crowd had we felt it was fair. We truly had Wauwatosa’s best interests at heart when we conceived this event. We knew our people would keep our space clean, which they did. We also knew attendees would spend $1,000′s of dollars in Tosa the day of the event, which they also did. The police asked us to fence up as much of the event as we could and we obliged. In addition, we even took it a step further and spent $100′s of dollars to have shuttles running from a local Park and Ride to help avoid traffic congestion in the event area. We used local suppliers for as much of the stuff as we could and hosted an after party at a family owned Tosa bar/restaurant. We did everything we were asked to do and more. I know the local businesses benefited from the event and it also made for a great advertising for that wonderful amphitheater we held the event in. I want to make something 100% clear! All the people from Wauwatosa we had dealings with were wonderful. The police that worked the rally were top-notch. I take issue with a police chief that believes he has a right to stifle free speech. This is an issue that both sides of this debate should agree on. Voltaire once stated I do not agree with what you have to say, but I’ll defend to the death your right to say it. His words ring as true today as when he said them almost 300 years ago. Here’s to the powers that be in Tosa getting this one right, for all of us. 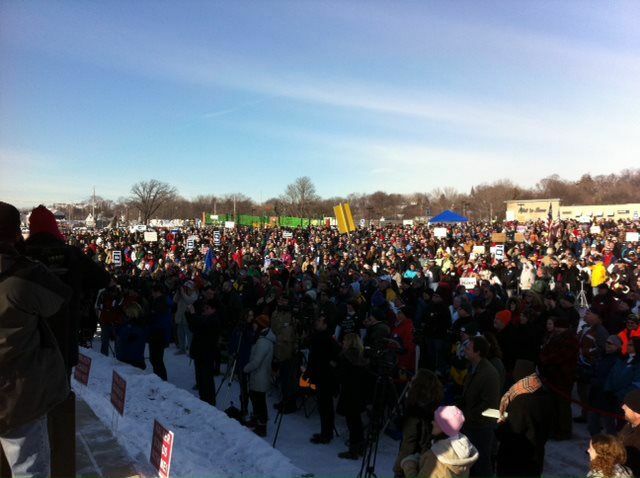 Wauwatosa's Police chief wants the power to say no to future political events like the one pictured above. This entry was posted on March 1, 2012, 12:59 am and is filed under Uncategorized. You can follow any responses to this entry through RSS 2.0. You can leave a response, or trackback from your own site.